A combination of environmental as well as genetic factors contribute to an individuals susceptility to Graves' disease. Other thyroid autoimmune responses are also seen concurrently in patients with Graves' disease. Especially TPO (thyroperoxidase) antibodies occur in up to 80% of Graves disease and serve as a readily measurable marker of autoimmunity. There is no direct correlation between the level of TSI and thyroid hormone levels in Graves' disease as the coexisting thyroiditis can also affect thyroid function. 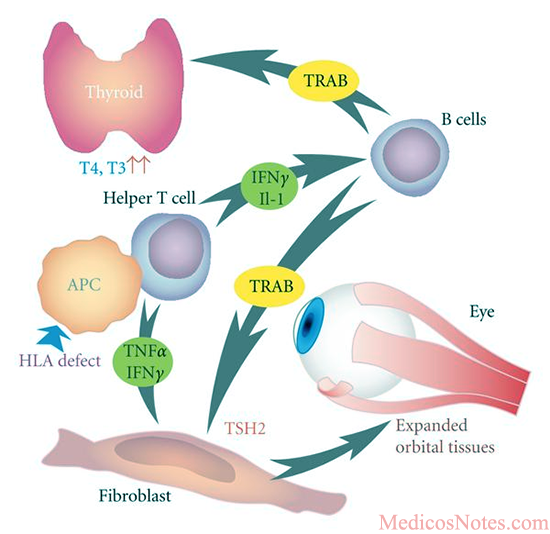 Cytokines play major role in thyroid ophthalmopathy. There is infiltration of the extraocular muscles by activated T cells,there is release of cytokines such as IFN-, TNF, and IL-1 which in turn results in fibroblast activation and increased synthesis of glycosaminoglycans.These glycosaminoglycans trap water, there by leading to characteristic muscle swelling.In the later stages of the disease, there is irreversible fibrosis of the muscles. Why there is more ocular involvement ? Orbital fibroblasts may be more sensitive to cytokines, perhaps explaining the ophthalmic localization of the immune response. An additional cause of retrobulbar tissue expansion is increased fat deposition. All these will increase the intraorbital pressure which will lead to proptosis, diplopia, and optic neuropathy.